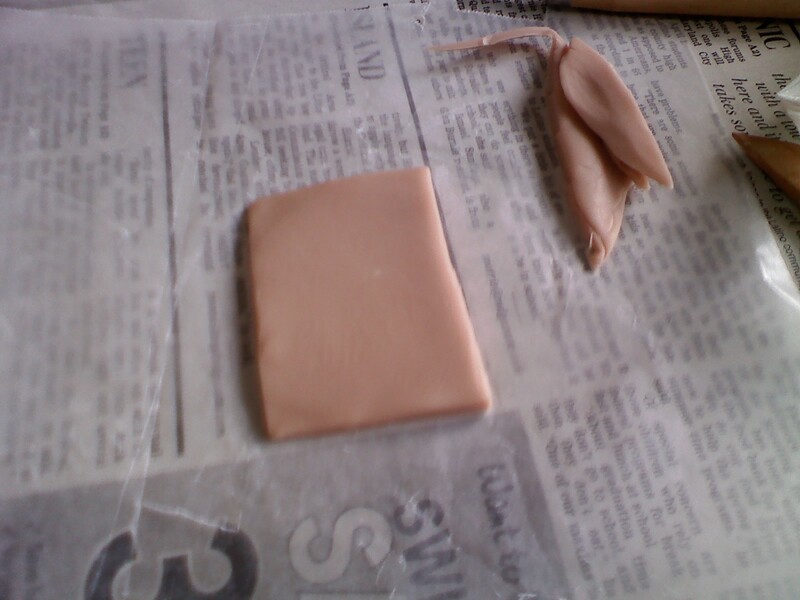 Super Sculpey (Also available at local crafts stores) – We bought 1 box and had plenty left over. Clay Sculpting tools – Anything that can flatten and cut the edges for creating a square should work. Handful of small pebbles – We found a rock we liked and smashed it into smaller pieces. Wax paper – Foil should work just as well, just need something to place the sculpey on while working with it and for cooking it. Acrylic Paints – Probably a black and white to be mixed for making shades of grey. 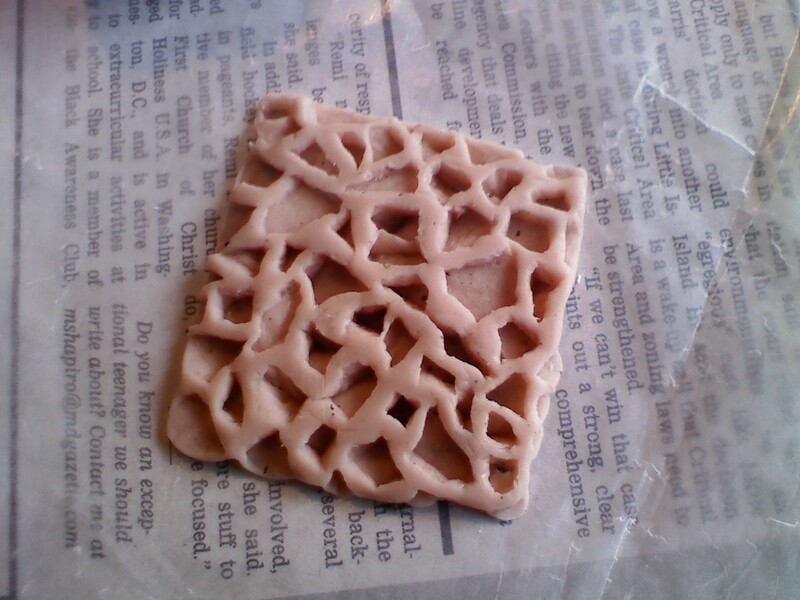 We started by taking some sculpey and making it flat on the wax paper, leaving maybe 1/2″ thickness. 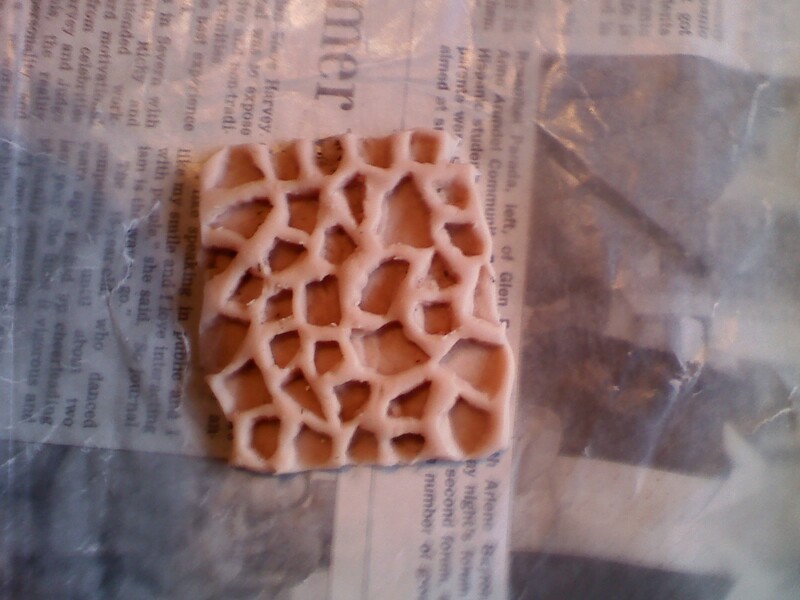 Then we used the sculpting tools to cut it into a rectangular shape. 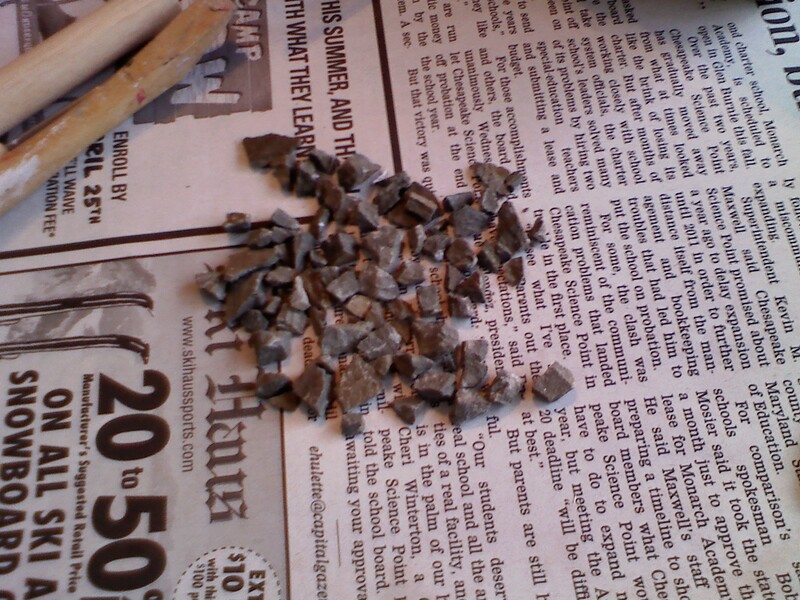 The next step was to take the small rocks/pebbles and gently push them into the sculpey, one at a time. We left the rocks in until the stamp was full of them. Once we filled the stamp up with rocks we gently removed them all and then cooked the stamp in the oven following the instructions on the sculpey box (130C or 275F for 15 minutes). Once the stamps are finished cooking (and cooled off) it’s time to test them with some foam. We pressed them directly onto our blocks. One of the things that we learned pretty quickly was that it took a LOT of pressure to make a decent indentation in the foam. 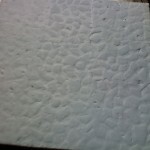 We are still trying to figure out a good way to make a larger indentation in the foam. Success! … sort of. We know that the process works, but we noticed that the gaps between the stones themselves looked too large. This should be easily corrected by simply placing the rocks closer together when making the stamp. The next step was to figure out how to paint it all. I quickly tossed some brown paint on to make sure the cobblestone would still stand out some after being painted. Testing out some painting techniques. 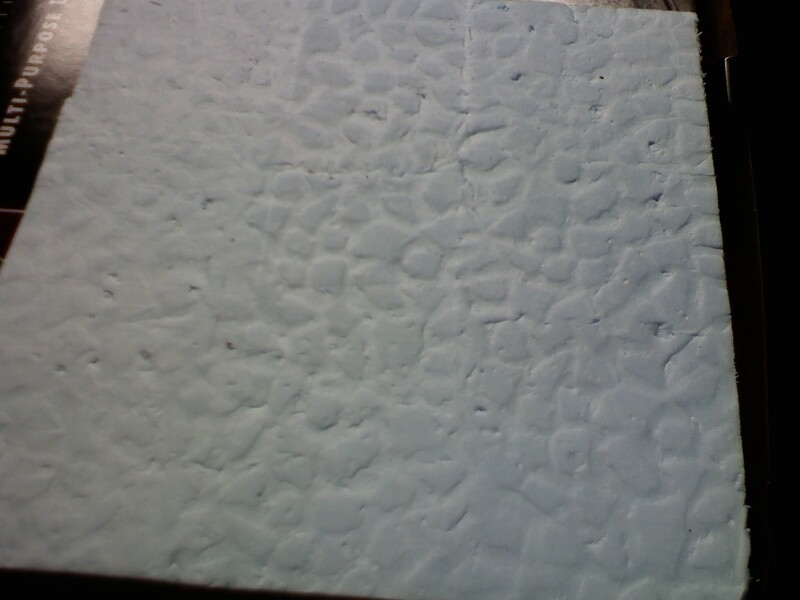 As you can see from the test piece, we might need to make a deeper indentation to make it look better after painting. We still have to decide on colors as well. Some ideas I’ve had are brown base with grey rocks, light grey base with dark grey rocks, or dark grey base with light grey rocks. We’ll have to test them all out to see which looks best, but that’s for another day. 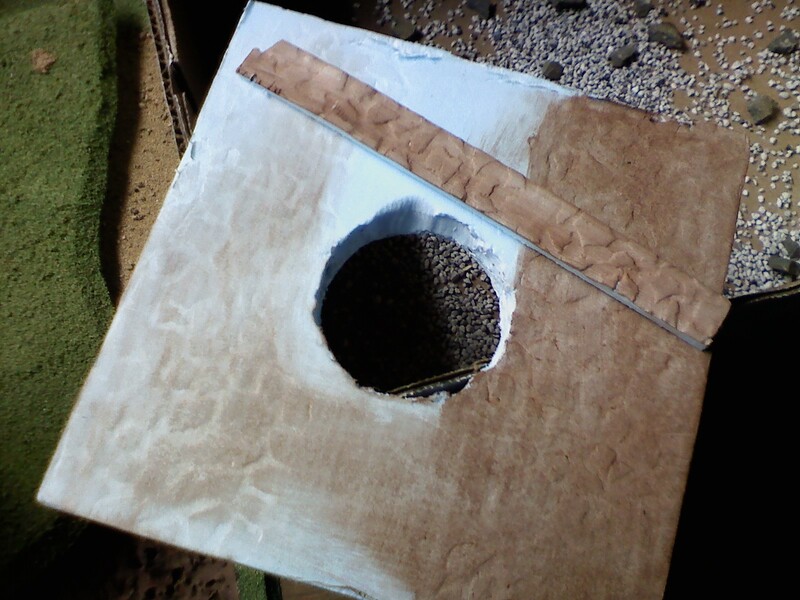 This entry was posted	on Monday, April 27th, 2009 at 11:47 am	and is filed under How-To, Terrain, Work In Progress. You can follow any responses to this entry through the RSS 2.0 feed. You can leave a response, or trackback from your own site. With the painting on Styro I would suggest getting the impression deep enough to use a covering of joint compound 5 parts to paint one part as a cover and then pain over that. You do not need a deep covering. Just enough to coat the surface.